I am happily ensconced with family this Christmas Eve and thought I would again share some excerpts from my great-great grandmother’s journal, specifically her Christmastime entries in 1888. To refresh on the cast of characters: Emma and her husband Frank lived in Williamsburg, MA with their five children: Prescott, Mattie, Emma, Henry, and Susie. Susie, the youngest, was almost two years old at the time of this entry. They also lived with Frank’s mother and stepfather. Emma’s younger brother, twelve-year-old Arthur, is also mentioned below. Pleasant and cold 2⁰ above 0 this morn. Mother baked bread and pies. Things are all ready for company – they all stayed down to Mr. Wheelers to supper then came up here in the evening. Frank came on the last train bringing Christmas presents from Aunt. S. and some that he bought himself. We had a treat on crackers, cheese and oranges. Ed. Geckler wife and children have the west chamber his father and mother had the front east chamber. Very pleasant not quite as cold. The friends brought a Christmas dinner for Mr. Wheeler and have gone down there to help him eat it. They all came back here before dark. We have not been to church – papa was too tired. Spent the eve looking at an old diary over 130 yrs. old it belonged to a Mr. Lemuel Snow. Very pleasant and growing warmer. We had our Christmas dinner today had chicken pie, scalloped oysters, pickled pears, sweet pickle cucumber and sour cu. bread, butter, apple, mince and cream pies. Father, mother and Arthur came while we were eating dinner. Christmas tree in the evening. Frank and Ed. 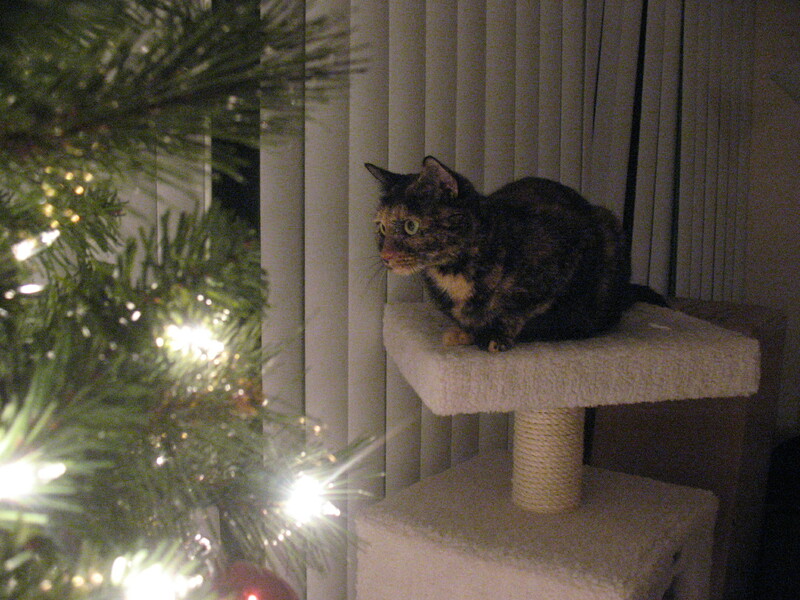 cut one down to Mrs. O’Brien’s, they brought a little tree for Susie. Every one seemed to have a nice time. The children all had pieces to speak. Sadness mingled with our joy. Rec’d telegram that Aunt Ruby died last Sat. Funeral is to be Wednesday noon. Very pleasant and warmer – windows and doors open to be comfortable. The friends all left on the 10-15 train. Mother went to Montgomery. Father and Arthur went home after dinner. Frank Williams stopped here to dinner. Frank left for Huntington on the 5 o’c train. Mother and I have been putting things to rights after the party. Ed. gave us a picture of himself and family. We all had a great supply of presents and good time all around. Prescott had “The Boys of ‘61” from Mrs. E. Geckler. I had a footstool, farmer’s satin apron, two white aprons, two boxes of writing paper, etc. etc. Bookish trivia: The Boys of ’61 is a book written by journalist Charles Carlton Coffin, published in 1881. It’s full title is: The Boys of ’61 or, Four Years of Fighting; Personal Observation with the Army and Navy, from the First Battle of Bull Run to the fall of Richmond. Coffin covered the war for the Boston Journal and would stay with Union Army camps and was on familiar terms with Union Army officers. It’s possible that Emma was related to the Lemuel Snow whose diary they read. Her mother’s maiden name was Snow. I was amused that I was reading a nearly 130 year old diary which had an entry about reading a 130 year old diary. The day after we visited Petra was quiet. 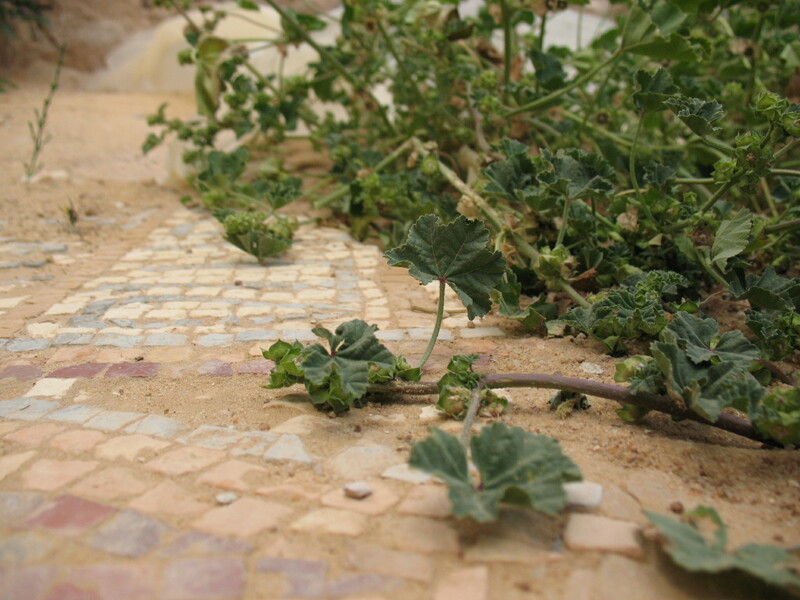 We were invited to a delicious meal with a family my sister knew, and enjoyed Jordanian hospitality. 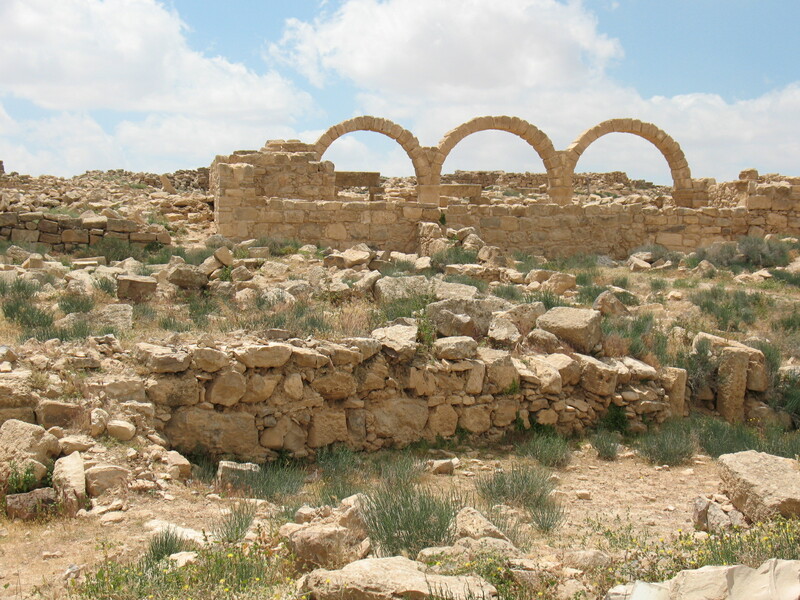 The next day, our last day in Jordan, we visited Umm Ar-Rasas, a UNESCO World Heritage site. 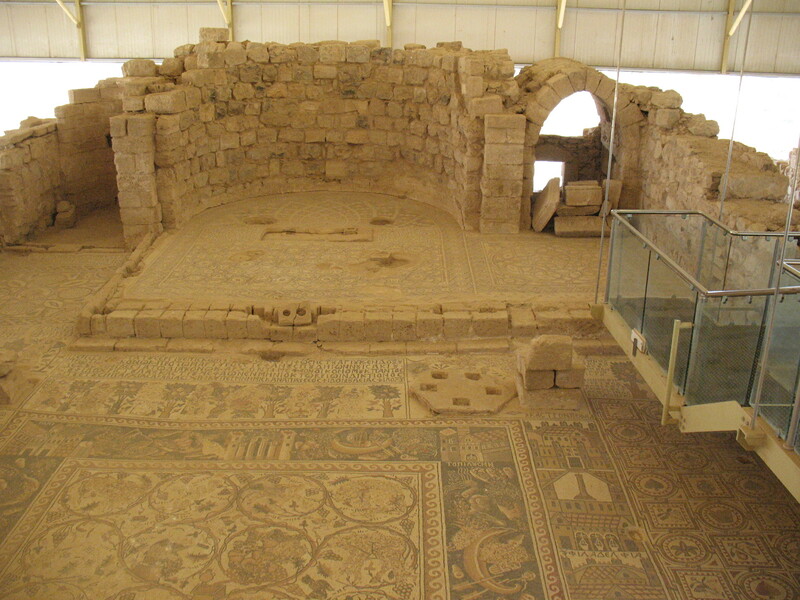 Umm Ar-Rasas primarily consists of Byzantine church ruins, but also includes relics of eras before and after that. We arrived just as a French tour group was leaving, meaning we had the ruins all to ourselves. 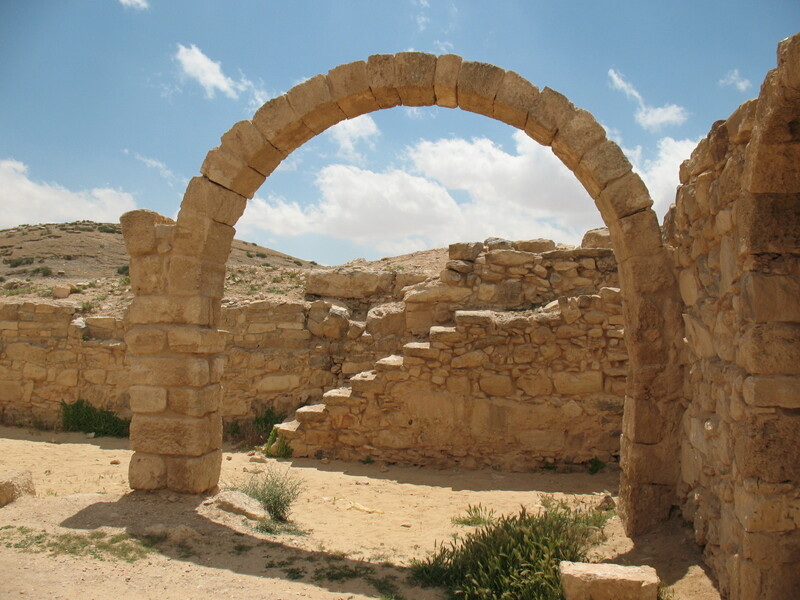 While perhaps not as showy as Petra or as grand as Wadi Rum, Umm Ar-Rasas offered the most direct, tactile experience of history experienced on our trip. 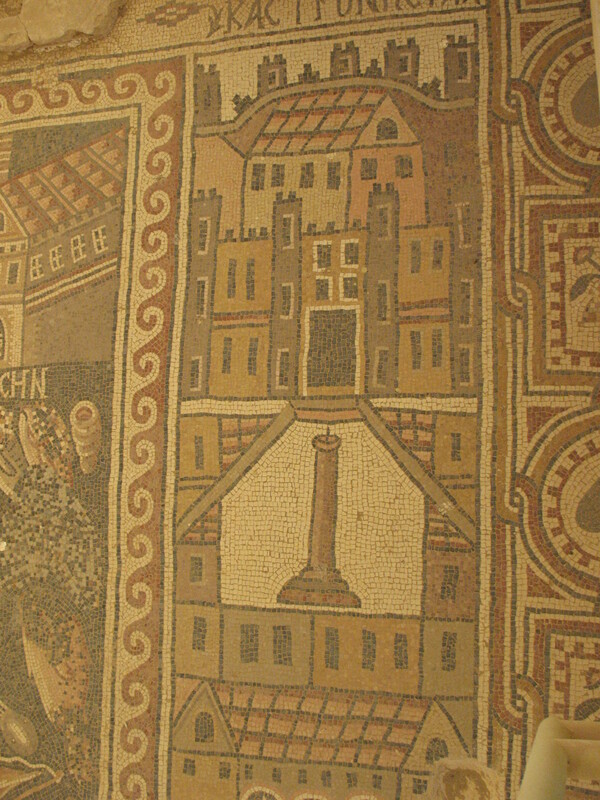 One church’s mosaic floor was protected by a canopy and catwalk, but the rest of the ruins were in a partially-excavated state. 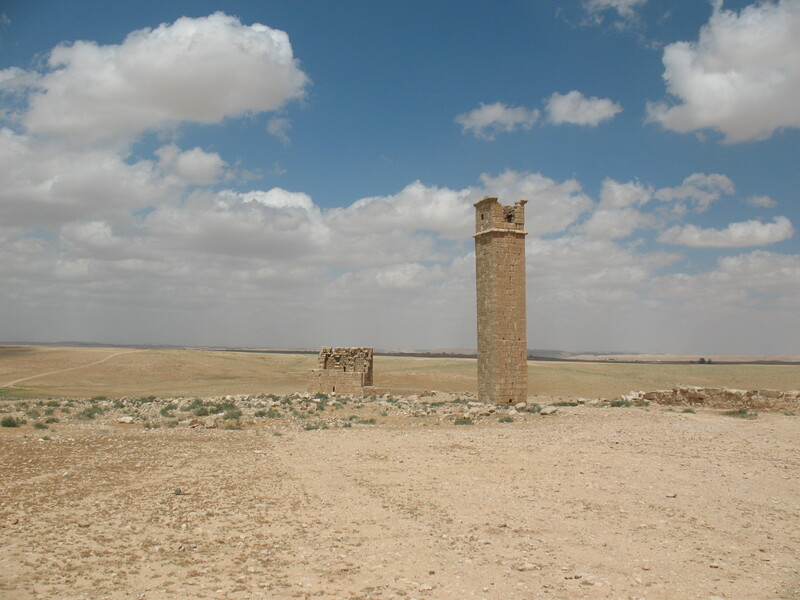 There was also a Stylite tower nearby, where a monk or holy man would have sequestered himself. Next to the tower there was a hostel for the pilgrims. We concluded our trip with a sunset picnic near Mt. Nebo, before Jen and I boarded our flight back to the States. There is definitely much that I didn’t have time in Jordan to see, but I would love someday to go back to both Istanbul and Jordan. It happened again. I was innocently visiting the library in order to return one book and pick up another, and it happened to be library book sale weekend again, so I wandered into the sale room . 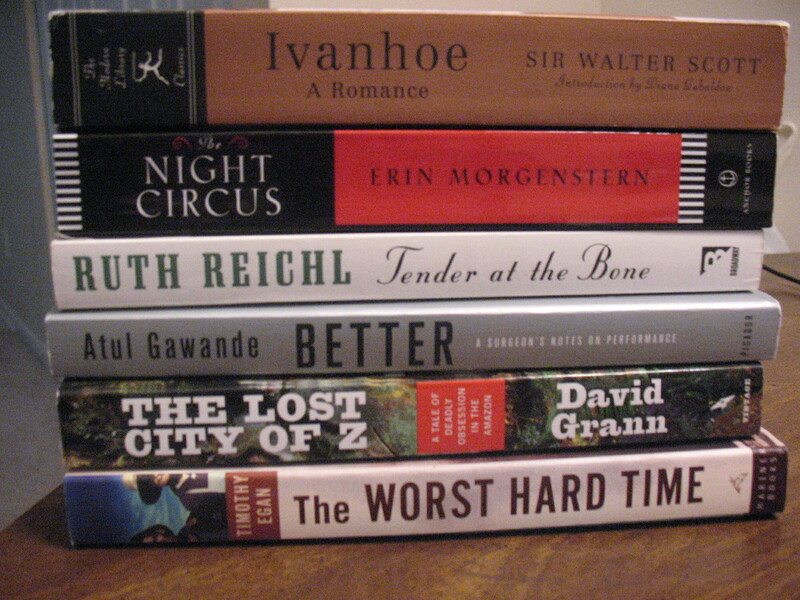 . . and came out with six lovely books. Ivanhoe by Sir Walter Scott – I enjoyed Scott’s The Talisman, and Ivanhoe is on my Classics Club list so this was an especially great find. The Night Circus by Erin Morgenstern – I was a little surprised to see this one at the sale – it’s so popular that I thought someone would have nabbed it way before me, especially those who buy books in order to resell them. But then I saw that the front cover was bent at the corner. The novel has such a famously pretty cover that I can see that its mussed state may have turned away other prospective buyers. Tender at the Bone by Ruth Reichl – I’ve heard really great things about this food memoir. Better: A Surgeon’s Notes on Performance by Atul Gawande – I’ve been meaning to read one of Gawande’s medical nonfiction books for a while. The Lost City of Z: A Tale of Deadly Obsession in the Amazon by David Grann – this is the find I am most excited about. I had told my cousin about reading Brazilian Adventure by Peter Fleming, a 1933 travel memoir about Fleming’s participation in a search for the missing explorer Percy Fawcett. My cousin reminded me that The Lost City of Z by David Grann is also about Percy Fawcett’s disappearance and Grann’s own retracing of Fawcett’s expedition. Perfect companion reads! The Worst Hard Time: The Untold Story of Those Who Survived the Great American Dust Bowl by Timothy Egan – I’ve been meaning to read one of Egan’s books since I saw him speak at the National Book Festival three years ago. So here it is! With these additions to my book collection, I think that I am going to commit to the TBR Triple Dog Dare (hosted by Ready When You Are, C.B. ), which challenges readers/book bloggers to only read books we already own for the months of January, February and March of 2013. I adore using the public library, but I tend to check so many books out from the library that I push aside the books I want to read that are already in my home. That said, if a friend, relative or co-worker suggests reading a book together during those three months, I will absolutely break the Triple Dog Dare rules in order to participate. Building my bookish relationships totally trumps getting to my TBR. Other than that categorical exception, however, I will be cozying up with my own books this winter. 2013. Dutton. Hardcover. 452 pages. The River of No Return has been showing up on several blogs in my feed, but Reading Rambo’s was the first I read and her review easily convinced me to pick up this entertaining time-travel novel. About to lose his life during a battle in 1812, young British marquess Nicholas Falcott is suddenly transported to the 21st century. He is promptly collected by a powerful organization of time travelers called the Guild. The Guild educates him in the 21st century and sets him up with a generous living stipend. He and the other newly arrived time jumpers also learn that they cannot travel back in time, cannot live in their home country, and cannot tell anyone about the time travel. However, after ten years of living in Vermont, Falcott is summoned by the Guild to travel back to the year 1815 on a vague mission to stop a group of rogue time travelers called the Ofan. Meanwhile, in 1815, in the neighboring estate to Falcott’s, young Julia Percy suffers the loss of her grandfather and guardian, Lord Percy. Her heartless cousin Eamon, heir to the estate, believes that Lord Percy could control time through the use of an object, a talisman. Julia herself witnessed her grandfather’s power throughout her life, but thought it died with him. The River of No Return is a smartly written take on the time travel genre. Both the time travel aspects and the historical fiction aspects of the book felt well-realized. In a lazy writer’s hands, the Guild would probably have been this monolithic institution controlled by cold-hearted, inhuman officials. Instead, though the book hints early on that the Guild’s front of benevolence hides many secrets, the Guild’s motivations are an all-too-human mix of fear, greed, sorrow and traditionalism. The Corn Bill plot nicely parallels some aspects of the conflict between the Guild and the Ofan, and I’m grateful that Ridgway didn’t explicitly link them together and ruin the subtlety of her comparison. Ridgway’s entire cast of characters are an intriguing lot: Ridgway doesn’t expend all of her energy on the two romantic leads, Nick and Julia – who are both likable, to be sure. But I also enjoyed Nick’s steely sister Clare, his savvy former comrade-in-arms Jem Jemison, charismatic time jumper Alva Blomgren, and the commanding presence of Guild Alderwoman Alice Gacoki, among others. I hope all of them show up in the next book – and yes, the book is definitely set up to have at least a sequel. Although I did not find the ending to be a terrible cliffhanger, the narrative definitely promises that there is more to be revealed. 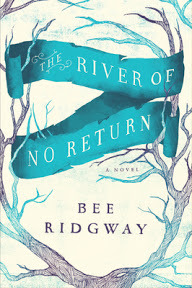 I count The River of No Return as one of the most pleasurable reads I have had this year. I only did this once before, but here is another Mondays with Bean post. Enjoy! A couple of weeks ago, I shared some excerpts from my great-great grandmother’s journal. Her name was Emma and she lived in western Massachusetts. The journal starts in 1888, and I’ve been retyping May, June and July today and thought I’d share some interesting tidbits. The very first entry in the journal listed everyone who lived in Emma and her husband Frank’s household. After listing their five children, as well as Frank’s mother and his stepfather, Emma states that there is also a “foreign man and woman.” I don’t know if it’s class snobbery or what that keeps her from referring to them by name in that first entry, but she names them in later entries: Mary and Ferdinand. Mary and Ferdinand do not appear to be a married couple as I wondered at first. Indeed, only a few weeks into the journal, Emma remarks that “Mary has not been in good humor the past week” and by the next week, Mary announces that she is going to Amherst after a new job that pays $3.00 a week. Ferdinand sticks around until June 5, 1888, when Emma writes, “Our hired man, Ferdinand, went away today – he intends to go home to Russia and return with his family next spring.” I do not believe that he shows up in the spring of 1889, but I’ll have to keep an eye out and see if his name is ever mentioned again. In the meantime, Frank and Emma start searching for new hired hands. [Wed., June 13, 1888] A beautiful day. I have been to So. Hadley to see about getting a girl – but did not think best to take her. I have had a delightful time – left home little before eight and took the 8.20 tr. for Northampton where I stopped to do a little trading then went on to S.H. took dinner at Mr. Lewis Porter’s – he is the Steward at the Fem. Sem. there, then Mrs. P. and I called on Frank Porter’s wife – then went into Williston Hall and the Sem. At 3 ½ o’c we went to see Miss M. Judd about the girl and met the high school teacher, Mr. Kelly. Miss Judd’s mother is an invalid cannot get about only as she goes in a wheel chair. I left Smith’s Ferry at 5 ½ P.M. waited in N. an hour found Prescott and papa at the depot waiting for me. Mattie stayed at home from school and did her best to help Grandma take care of Susie. The “Fem. Sem.” is referring to the Mount Holyoke Female Seminary; in 1888, the institution was actually called Mount Holyoke Seminary and College. Our woman has taken the washing and done it entirely without our help. The first hired help we have ever had that could do their work without being told how at every step. The very next day: “Louisa has done the ironing.” Apparently her laundry feat earned her a mention by name! A week or so later, and Emma’s mother-in-law gives Louisa lessons in washing clothes in kerosene (19th century dry cleaning). I still haven’t come across Louisa’s husband’s name, but I’m sure that will happen at some point. [Fri. July 13, 1888] Cool out of the sun. The children have built a stone fort out by the scales and put up three flags – I suppose they are Harrison flags. Not quite so windy today. We have been reading of snow-storms on Mt. Washington and damage done by wind and rain on the coast and all about the N.E. and Middle States. The counsel of ministers met in Conway yesterday to decide in regard to the disturbance there. They decided that Mr. Thomas should leave in three months. They had a long meeting lasting until late in the eve. Aunt Fannie called. Mother is not very well. Frank has a lame back. Mowing “lugs heavy” with him. We have used green apples twice this wk. I have been doing mending. I’m not certain, but the “Harrison flags” could be a reference to President Harrison’s 1840 Presidential campaign. That campaign was before Emma’s birth, but it was the first presidential campaign where a candidate used flags and posters and other such tools to promote his run for office. I was also curious about the ministerial “disturbance” at Conway (the town where Emma’s parents lived). I imagine it as an American version of the church politics featured in Trollope’s novels. Unfortunately, Emma did not see fit to follow up with more details on this incident and a search through The History of Conway through Google Books did not reveal further details.